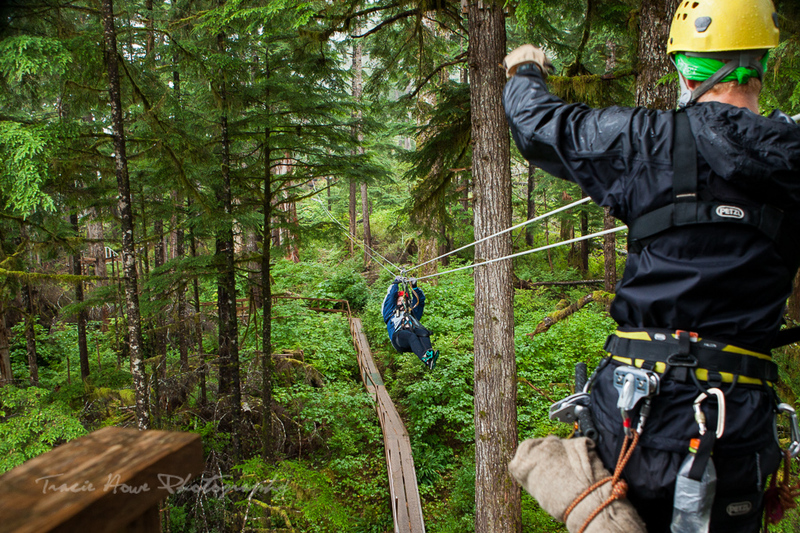 Jen & Tracie Go cruising - Ziplining in Ketchikan | Tracie Travels The misadventures of a restless photographer. Travel photographer and travel blogger, Tracie Howe, wanders the globe seeking out new adventures and photo opportunities to blog about. Join her for a unique perspective on travel, travel photography, and travel tips. 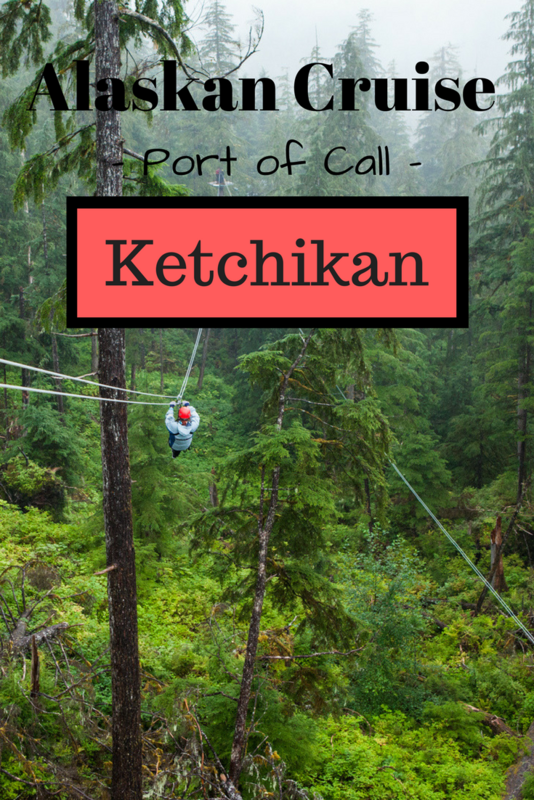 On the recent Alaskan Cruise Tracie and I took, the third, and final port of call was Ketchikan. 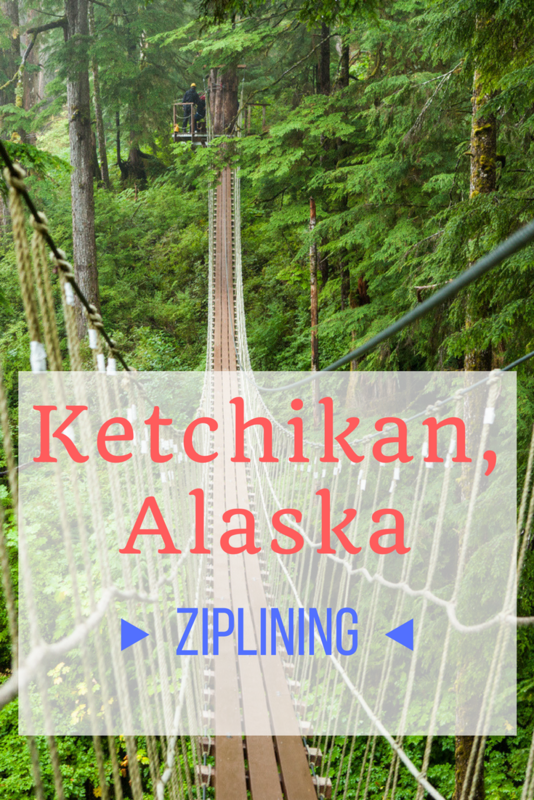 Famous for its cheesy and entertaining lumberjack show and for its liquid sunshine, Ketchikan is a lovely, and often wet place. Tracie and I have both been there many times in the past, and when the sun does come out in Ketchikan it is marvelous. 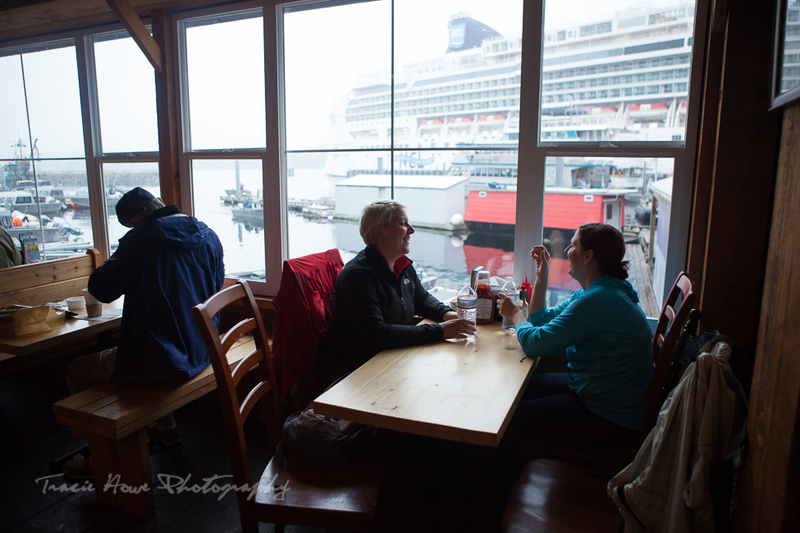 After enjoying sunshine nearly the entire cruise, we couldn’t exactly complain when grey, drizzly weather found us in Ketchikan. 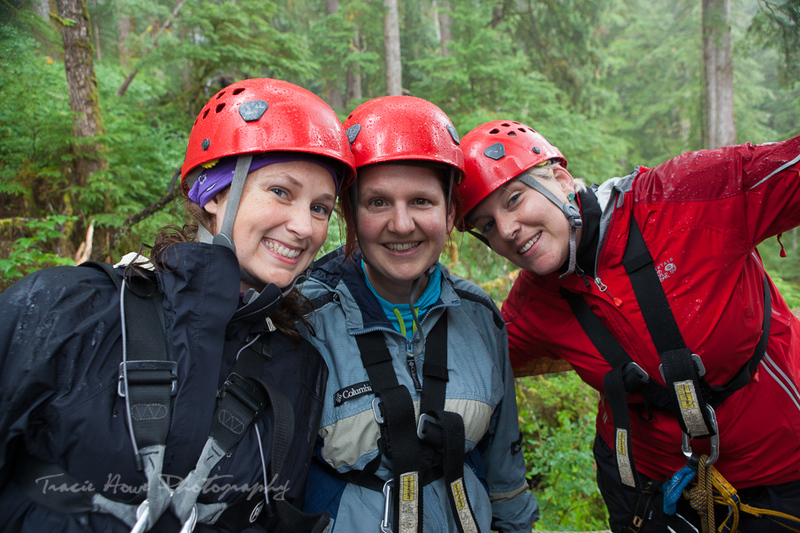 Inge, Tracie, and I went for a girls day out which started with an awesome Rainforest zipline expedition with Spirit of Alaska Tours. 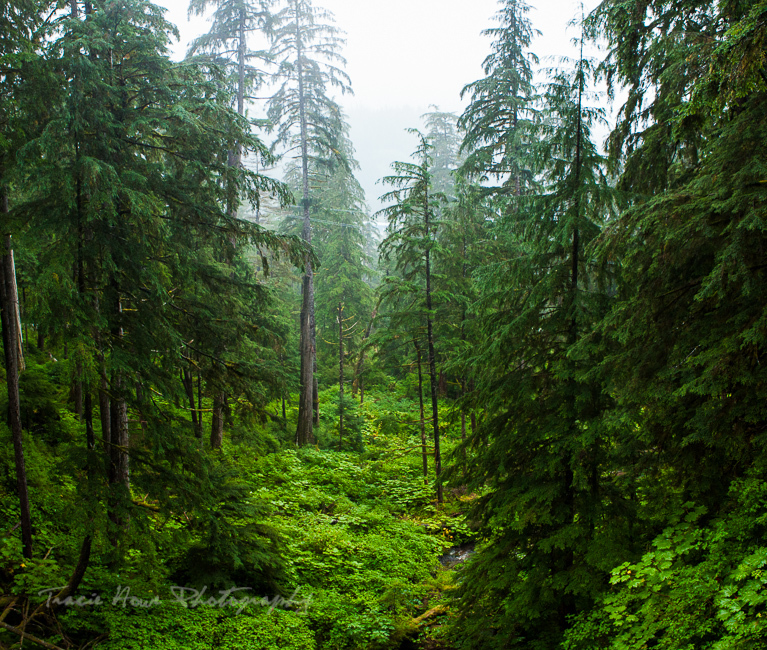 The drive out to the forest was beautiful and we were all looking forward to some adventure, not minding a bit of rain. 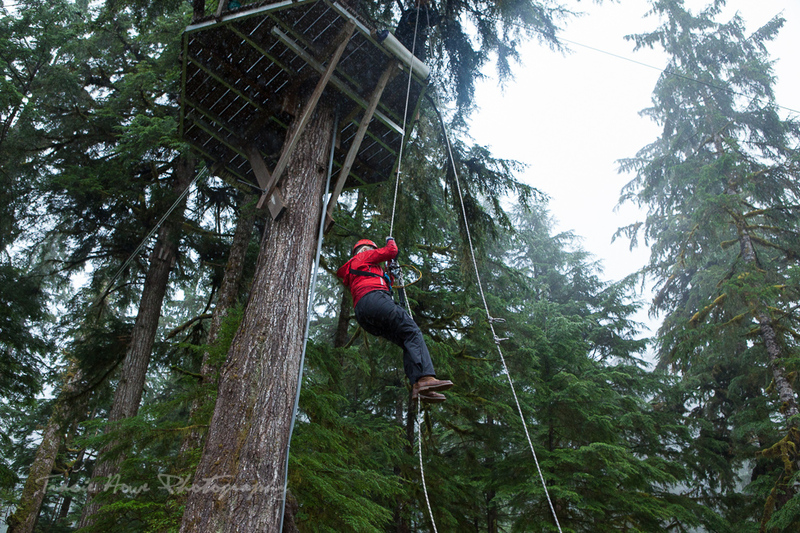 Alaska Canopy Adventures (the local tour operator for Spirit of Alaska Tours) offers several different tours, so we opted for the one with the most variety of activities. We got to do several ziplines, traverse a cool rope bridge, rappel (not far, but thrilling all the same), and go down a giant slide. The course is in the trees, surrounded by stunning scenery in all directions. 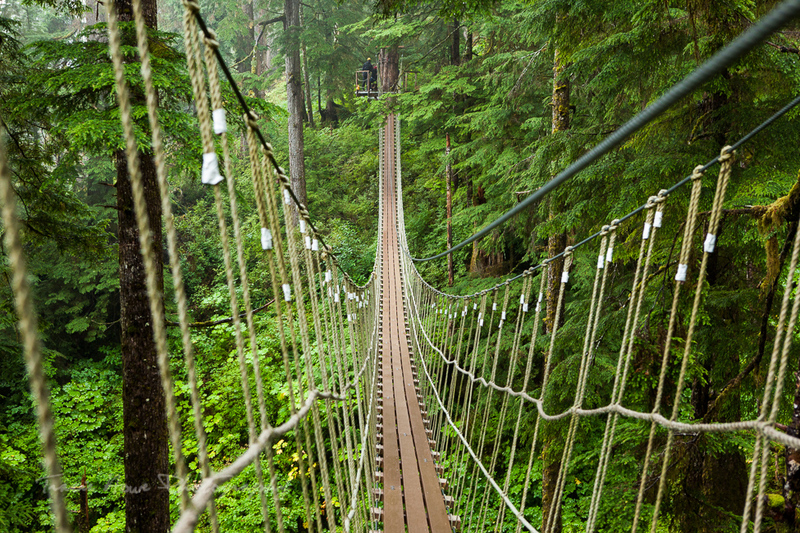 Rainforest walks were happening beneath us, and bears are often sighted by the walkers and zippers above. We were not lucky enough to see any bears this time but had an absolute blast on the course. 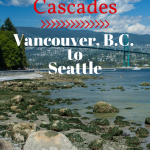 Throughout the entire tour, creeks were babbling, birds were flying by, and the air was as fresh as you’ll smell almost anywhere. 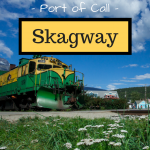 Alaska is just brimming with natural beauty and wildlife. It is a national treasure. A lovely lady from Australia partnered up with us and we made a dynamic lady team. She was rather nervous, but the three of us tried to keep her spirits up as she faced her fears. We all got a bit nervous at the rappel portion of the tour. I knew I wouldn’t free fall upon stepping off the platform, having seen several others go before me, and yet when I stepped off I held my breath, not totally sure I wouldn’t fall. It was a relief to safely rappel, but still caused an adrenaline surge. The mega slide at the end was reminiscent of the ones you find at carnivals and state fairs, but much faster! We were all handed a burlap sack and queued up for the impressively long slide. It was a total rush! All of us wished we could do it again immediately after. The gift shop at the end of the tour was pretty good as far as gift shops go, and we were offered salmon dip and hot cocoa – two things we were all too happy to warm up with. 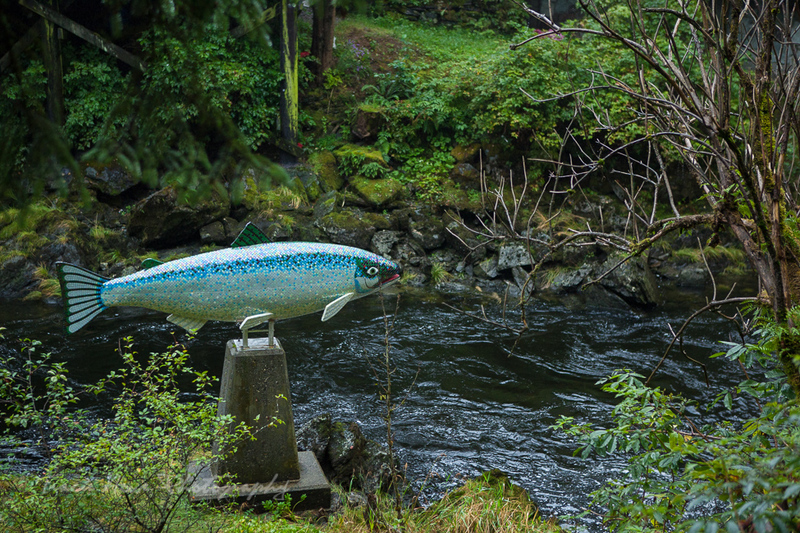 We ate possibly more than our fair share of salmon, and sipped on the yummy cocoa as we browsed Alaskan merch and admired the totem pole garden outside the shop. We got back to town with a few hours left of port time and decided to get lunch and explore. 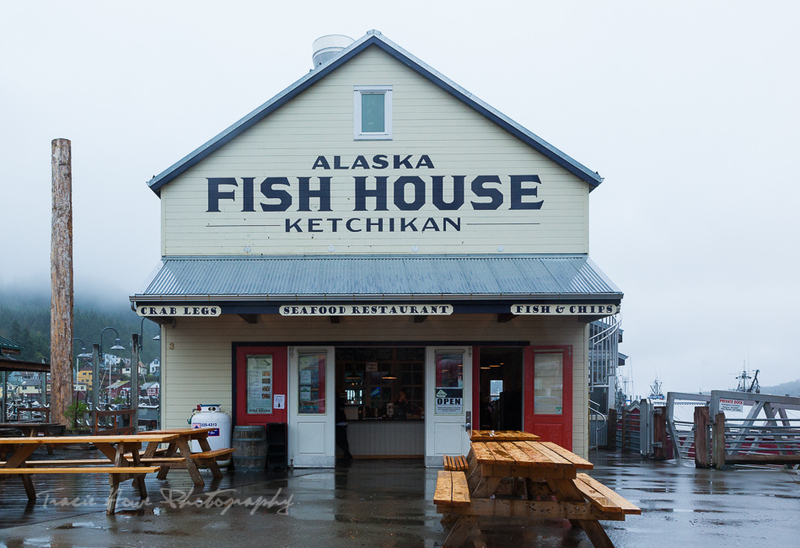 Inge suggested the Ketchikan Fish House and it sounded good to us, as neither Tracie or I had been there before. We had a seafood feast that was so delicious it made me sad I’d not discovered it before on my many visits to Ketchikan. The halibut fish & chips and salmon chowder were top notch. And the house corn bread was incredibly flavorful with salmon baked into it. I wasn’t sure if that would work, but it absolutely did and I will be having it again the next time I am in Ketchikan. We watched boats coming in with fresh fish as we dined, happy to be so close to the source of our meal. 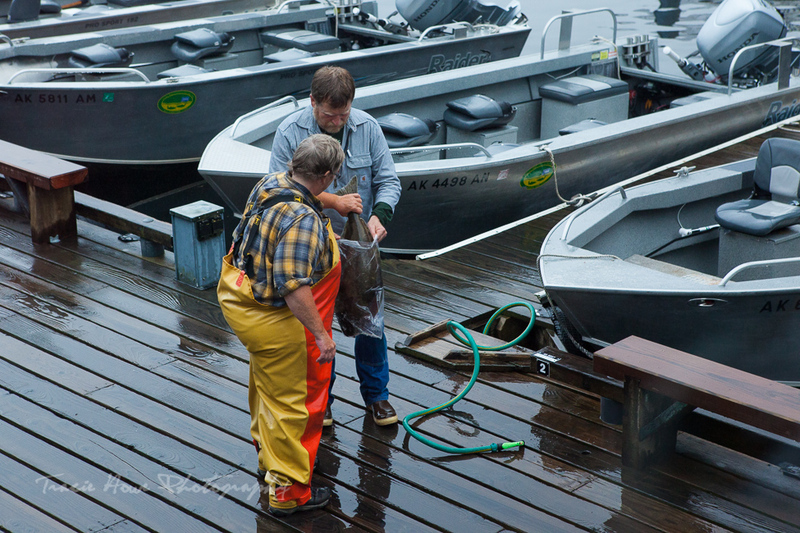 Inge pointed out a couple of fishermen with a fresh-caught halibut on the pier. The fish was massive, rather flat, and the first live halibut I can recall seeing. Fresh fish – straight from the boat to the kitchen! The girls and I rolled out of the Fish House, quite content. 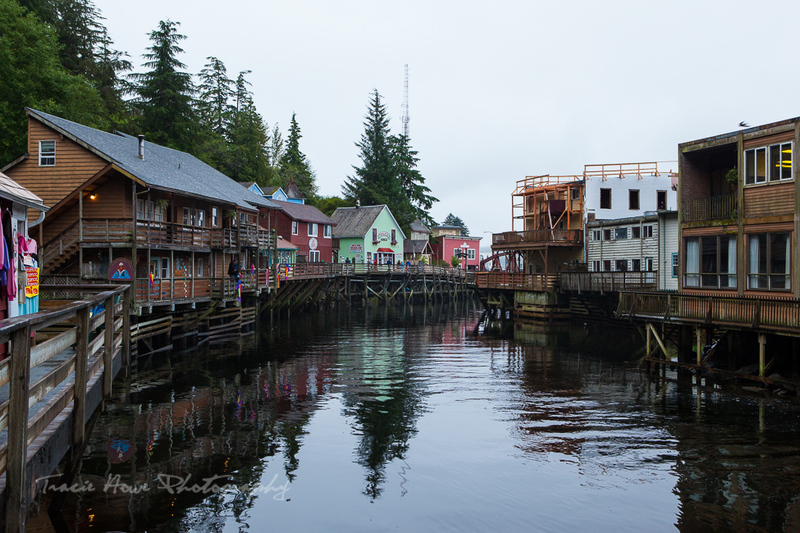 We walked off lunch by meandering the shops of Ketchikan. Historic Creek Street was our favorite part of town. Stilted above a creek, and full of interesting shops and a brothel museum. We saw salmon running up the stream as we walked. The sight of salmon leaping out of the water and up over the rocks is fascinating. I don’t envy them their task, or Tracie’s in trying to capture their swift leaping on camera at any point in the creek. We all split up as our time in Ketchikan was drawing to a close. Inge headed back to the ship to work, Tracie continued exploring and photographing Ketchikan, I wrote and mailed some postcards – a nearly archaic past time, but one I’m committed to all the same. It seemed rather appropriate for our final port to be a bit rainy. It did not put a damper on our day. We set sail in the evening, with another full day at sea ahead of us to enjoy before arriving back in Vancouver. 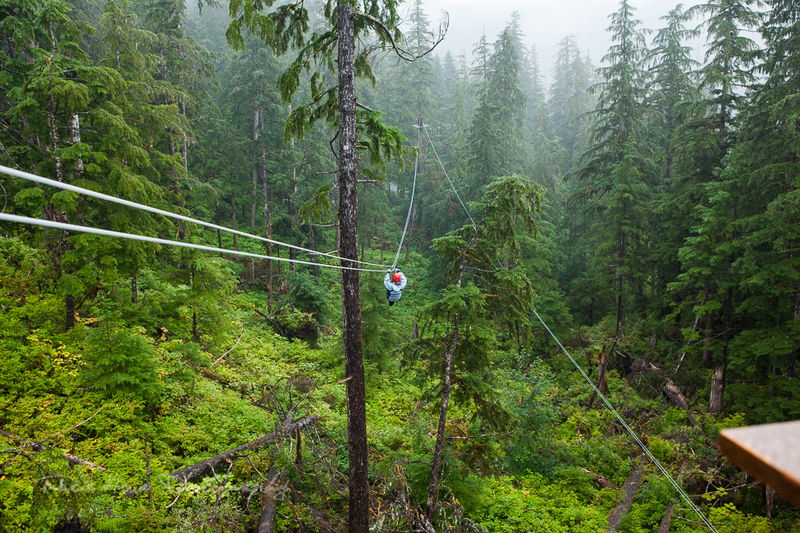 Indrani - Wow Ziplines! I can imagine the thrill there.